(Left to Right) Dr Anagha Jadhav, Director of Digital Pathology, OptraSCAN.Inc; Dr G S K Velu, Chairman, Neuberg Diagnostics; and Dr N Jayaram, Head of Histopathology & Cytology Services, Neuberg Diagnostics Network. The joint venture is in initial phase and will be formed in three months. The announcement was made at the annual event for the international medical laboratory community, MedLab 2019 in Dubai, United Arab Emirates. The Global TELEPath Network, promoted by OptraSCAN was launched in US and European region last year. The joint venture combines the exceptional histopathology and cytology services provided by Neuberg Diagnostics with advanced digital pathology capabilities offered by OptraSCAN and brings to the table a whole new array of services related to digitization of tissue slides and telepathology with an objective of making new-age life-saving healthcare technology available to the human kind. The JV promises access to a large pool of histopathologists – who diagnose and study diseases using expert medical interpretation of cells and tissue samples – from UAE, India and South Africa. Histopathology is, among other applications, integral to cancer management through the staging and grading of tumours. 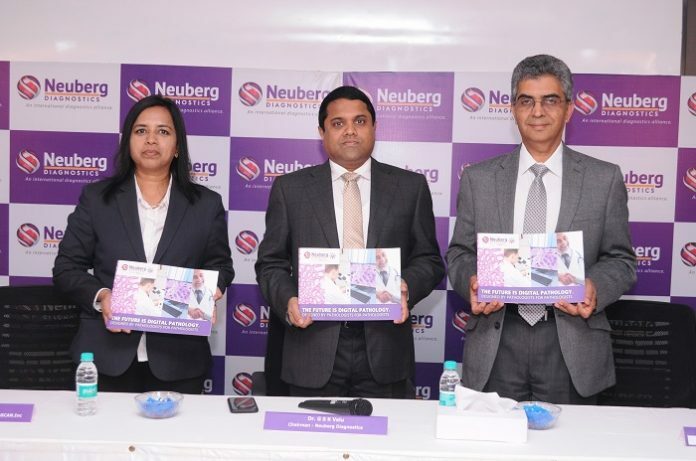 “Neuberg’s vision has always been to deploy the most advanced technologies assisted by data science and artificial intelligence tools. This has brought some of the best pathologists, biochemists, geneticists, microbiologists and several other clinical lab professionals from around the world to work closely, sharing knowledge and using the latest generation of diagnostics techniques”, said Dr GSK Velu, Founder & Chairman, Neuberg Diagnostics. This new venture ‘Neuberg DIGIPATH, powered by OptraSCAN Inc.’ services comprise of digitization of tissue slides, storage and archiving, slide discussions and digital learning modules, automated slide processing platforms and second-opinion tele-consulting services. Apart from user-friendly features like a compact, high-resolution and cloud-ready platform with smart-recognition facilities, the new entity promises an economically priced “walk-away technology” for the healthcare sector. Among other collaborative areas are cost effective neutral digitization services for all healthcare institutions and patients in all key locations where Neuberg network is present besides the digital sharing and learning platform for practicing Pathologists & Pathology Students using Data Analytics, Artificial Intelligence Tools and Digital Slide Library. Through this partnership joint venture, both the companies aim to expand their market base and have planned a phase and region-wise expansion. In phase-I, the JV intends to launch its products and services in UAE, India and South Africa; followed by Phase-II, wherein it hopes to expand their offerings to Rest of Asia, Europe and the rest of Africa. The JV partners intend to make on-demand cutting-edge digital pathology solutions available to leading hospitals in the Middle East region thus taking healthcare and diagnostics deep into the digital age. “Digital pathology – the future scope of pathology opens up new vistas to daily reporting, expert opinions, peer consults, quality assessment, storage and artificial intelligence NEUBERG DIGIPATH builds bridges along this journey with complete digital pathology solutions” says Dr Jayaram, the Head of Histopathology & Cytology Services of Neuberg Diagnostics Network. Previous articleIs phage therapy an effective solution to curb antibiotic resistance?